You can imagine an early hunter-gatherer in the Middle East looking for that next meal, roaming some new countryside, trying a taste of this or that insect, animal, or plant. Seeds, high in nutritional value, are generally worth trying. So, often, are the pods and fruits that surround them. On this particular day he or she finds a patch of waist-high plants growing in an open area, each head nodding under a heavy, fist-sized, waxy, light green seedpod. Worth a try. A sniff. A small bite. A grimace and a spit. The flesh of the pod is mouth-twistingly bitter, and this is a bad sign. We are wired to sense a lot of poisonous things as bitter; this is nature's way of telling us what to avoid. Bitter usually means a stomachache or worse. So our early explorer turned away from the plants with the big seedpods. Then an hour or two later, something strange. A dreaminess. An easing of pain. A pleasant sense of well-being. A connection with the gods. This plant was holy. It might have started that way. Or it might have started when a sharp-eyed early human noticed some animal feeding on those same seedpods and afterward acting a bit odd, also a sign from the gods that the plant had power. We do not know how it happened, exactly, but we know something about when. The long love affair between humans and this miraculous plant started more than ten thousand years ago—before towns, before agriculture, before science, before history. By the time the first human cities on earth were rising in the valleys of the Euphrates and Tigris Rivers, this holy plant's seeds were being eaten as food, its bitter sap was being used as a medicine, and its praises were being sung. During the excavation of a four-thousand-year-old palace in what is today's northwest Syria, archaeologists recently found an unusual room near the kitchens. There were eight hearths and a number of large pots, but there was no food residue. Instead, they found traces of poppy along with heliotrope, chamomile, and other herbs known to be used in medicines. Was this one of the world's first drug-manufacturing sites? The plant at the center of this ancient attention was a particular strain of poppy. The seedpods, especially the sap in their outer walls, had effects that were so powerful, so healing, that it seemed almost supernatural. A terra-cotta statuette found on Crete and dated back more than three thousand years shows a goddess with a headdress adorned with pods of poppies, incised exactly as the pods are cut today to harvest the sap. "The goddess appears to be in a state of torpor induced by opium," wrote one Greek historian. "She is in ecstasy, pleasure being manifested on her face, doubtless caused by the beautiful visions aroused in her imagination by the action of the drug." Some archaeologists have proposed that the room in which this goddess was found was used by Minoans for inhaling the vapors of dried poppy sap. The Greeks associated the plant with their gods for sleep (Hypnos), night (Nyx), and death (Thanatos), and put its image on coins, vases, jewelry, and tombstones. In myths, the goddess Demeter was said to have used poppies to soothe the pain of losing her kidnapped daughter, Persephone. The ancient poet Hesiod wrote eight centuries before Christ of a town near Corinth in Greece called MekonÍ, which translates roughly as "Poppy Town," which some historians believe got its name from the extensive poppy farms that surrounded it. Homer mentions the plant in the Iliad, and in the Odyssey he tells the story of Helen making a sleeping potion, assumed by many to include poppy sap. Hippocrates mentioned poppy frequently as an ingredient in medicines. It was part of temple rituals, carved into statues, and painted on tomb walls. Dried and eaten or smoked, it was early man's strongest, most soothing medicine. Today it is among the most controversial. It is the most important drug humans have ever found. 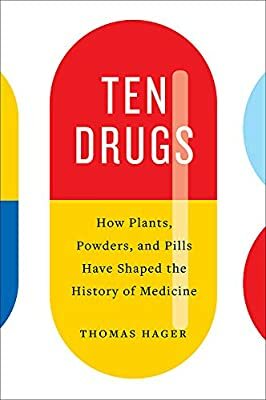 In a way it's amazing that early humans ever discovered any natural drugs at all. Consider that 95 percent of the three-hundred- thousand-odd plant species on earth are inedible by humans. Go out and start randomly munching the greens in your local woods, and the odds are twenty to one that you'll double over, throw up, or die. Among those few plants that are digestible, the chance of finding useful medicine is close to zero.